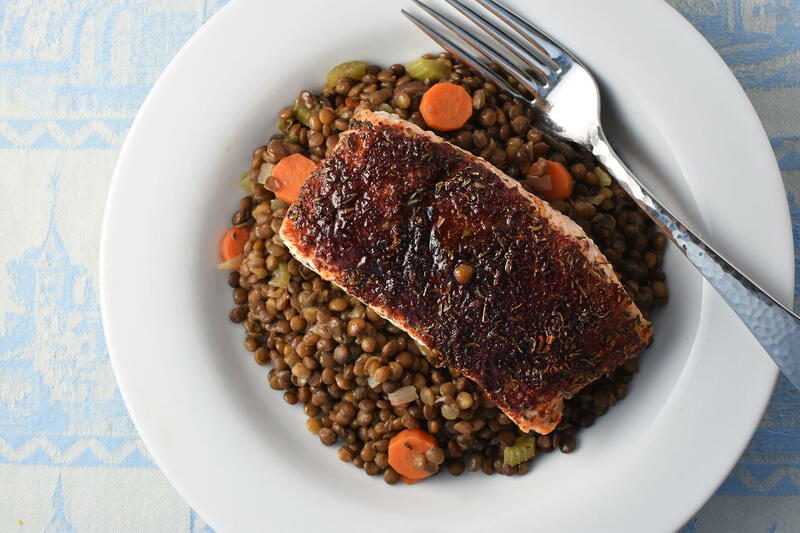 This recipe for Smoky Cinnamon Salmon with Mushroom Lentils is a mid-week “go-to” favourite for many reasons, but the first is it can be made in under 30-minutes. The second reason is one of my favourite spices is Spanish smoked paprika, known in Spain as pimentón. Although you can use regular paprika or Espelette pepper (Piment d’Espelette) from the Pays Basque in France, both spices will change the flavour slightly. 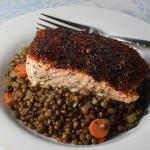 Enjoy the roasted salmon on a bed of lentils and a lovely glass of wine. This salmon dish is easy, tasty and full of wonderful spices. Finely grate zest from the orange and set aside. Juice the orange and measure ¼ cup of juice and set aside. Reserve remaining juice for another purpose. Mix orange juice, olive oil, and 1 teaspoon of the thyme in small bowl. Place salmon in large glass dish and add marinade. Turn to coat well. Cover and refrigerate 30 minutes. Mix sugar, smoked paprika, cinnamon, orange peel, remaining teaspoon thyme, and sea salt in a small bowl. Remove salmon from marinade. Place on greased foil-lined baking pan. Rub the top of the salmon pieces evenly with smoked paprika mixture. Discard the marinade. Roast salmon in preheated 400°F oven for 12-13 (10-11 minutes if wild salmon) minutes or until fish flakes easily with a fork. For thin filets, reduce cooking time. While salmon is roasting, make the lentils. Heat the oil in a saucepan over medium-high heat and sauté the carrot, celery, and shallot until clear and softened a little. Add the sliced mushrooms and continue to sauté until they have released their liquid and are beginning to brown. Add the thyme, and cook another minute. Add the lentils, broth, and wine, then season with salt and pepper. Cook at a brisk simmer until the liquid has almost completely evaporated. 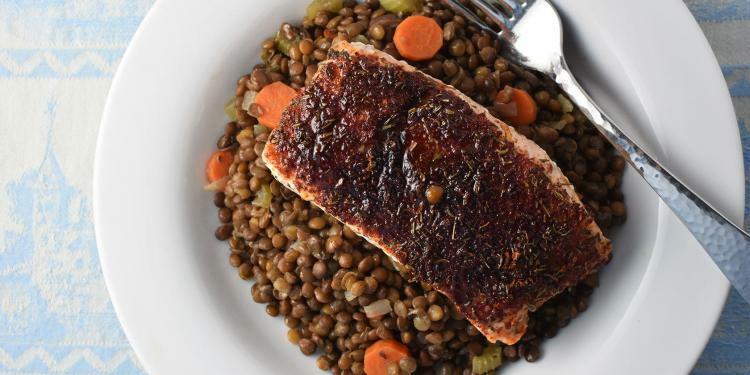 Divide the lentils among four dinner plates and top with the roasted salmon.